One of your classic bodice-ripper pulp romance moves is to sweep your lover up off her feet and carry her off, ideally just as the music swells up and, in PG-rated movies, the screen fades to black before you actually reach the big four-poster bed and get to business. Obviously it's a matter of upper body strength, but no one said it's only guys that are allowed to do it. Born on the evil, warlike planet Apokolips, Barda was specially trained in all forms of combat by Granny Goodness. However, she fell in love with Scott Free, a child of peaceful New Genesis raised on Apokolips, and used her warrior skills to help him escape to Earth. Barda accompanied Scott, and they married after he assumed the name of Mister Miracle, world's greatest escape artist. Since then, she has fought evil alongside her husband, both of them serving in the Justice League of America. 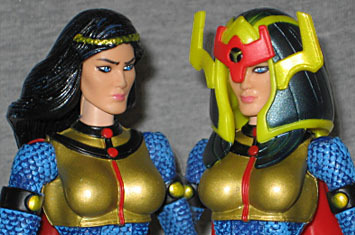 You'll recall from the review of DC Direct's "New Gods" Big Barda - you were paying attention, weren't you? There'll be a test later - that she and her Apokoliptian/New Genesian buddies aren't much on my radar. Luckily for toy manufacturers everywhere I'm not fussy (overblown sense of importance? You betcha), especially not when it comes to gorgeous she-titans, and since that first Barda figure was actually pretty good, it seemed worth taking a shot on a second. Hey, you don't amass fourteen Wonder Women by getting tired of characters quickly. I've seen some comment on this figure already, and the recurring theme seems to be "not big enough." Unfortunately that's true - Mattel's Barda stands about 6½" tall, the same height and physique as her DCU sisters Diana and Hawkgirl. Hawkgirl fer cryin' out loud! 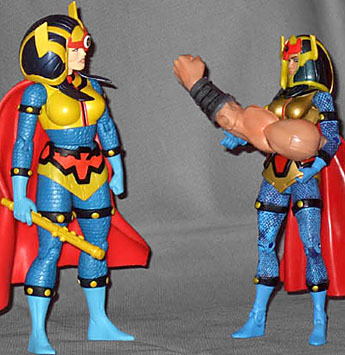 The costume helps a little, with the bands around her arms and legs (particularly the biceps) making her look a little more bulky than the smooth-limbed figures, but in the end it's not enough - she doesn't look like Big Barda, she looks like a regular woman in a Big Barda costume. Barda doesn't always need to have the made-from-reinforced-concrete powerhouse build of Kirby's artwork, but even when she's drawn slimmer and slinkier she's generally just plain larger than the average girl, like she's got some titan in her ancestry somewhere. However, that's but one aspect of the figure, and in other areas she's got a lot more going for her. The proportions of the body may be recycled, but the parts themselves bear fully sculpted scalemail-and-plate armour, with burnished gold on the skirt and top and heavy shading on the mail toning the traditional colours down to a point where Barda looks just fine standing alongside less eccentrically-attired characters. The wash naturally tends to pool a bit in crevices, so the scalemail isn't perfectly even, but the overall effect is still pretty good. Her cape is a slightly subdued red, and bunches realistically around the shoulders. There are two versions of this figure about, with and without her helmet - I only ever saw the helmeted one, so that's what I've got. The gold of the helmet (the colour the whole piece is cast in) is much paler and yellower than the plate armour of the costume, but the black is nice and lustrous without being outright glossy. Barda's face isn't so stylised as the DC Direct version, but does retain a little of the broad, flat quality, and looks quite lovely as well. The bare head, if you're fortunate enough to find it (and forever damn yo go re for his ungodly luck with ordering her blindly), uses the same facial sculpt as the normal release - you can just see it better. The hair acts as a replacement "helmet," plugged into the cranium in place of the warrioress's brain bucket. She's wearing a golden braided band around her forehead. The hair reaches a bit lower than the helmet, and is raised off her shoulders so it doesn't impede the articulation in the slightest. 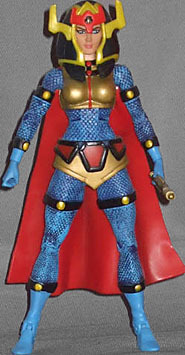 Articulation is where normally Mattel would leave DC Direct in the dust, but the latter's Big Barda was an unusual exception to their "What articulation?" policy, so the difference is actually pretty slight. DCU Barda has the standard allocation of joints: balljoint neck, swivel/pin shoulders, swivel biceps, pin elbows, swivel wrists, pin sternum, swivel waist, swivel/pin hips, swivel thighs, pin knees and pin ankles. The key differences are the sternum and ankle joints - for the rest, the hips are pretty limited by the skirt, leaving them not that much more mobile than DC Direct's peg joints, and she's actually lacking boot-top swivels, despite the shin band being an easy point to insert them. The wrist swivels also follow Mattel's plan blindly, ignoring the bands half-way along the forearm and inserting the joint lower down, where it's easily visible. 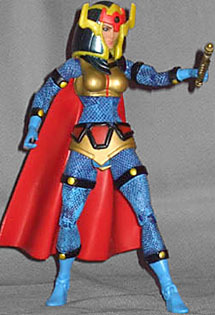 Barda doesn't go anywhere without her Mega-Rod, but like the figure itself, Mattel's Rod looks good but isn't that Mega - it's 1¾" long and fairly thin, though it does have quite a bit in the way of miscellaneous techy details, and the subdued gold matched the armour. Considering how simple they'd have been, it's a shame they didn't spring for a couple of Aero-Disks. They could have even reused the ones that came with the DCU6 Mr. Miracle and called it a day. She also comes with her designated Collect-&-Mail-To-Someone-Who-Wants-It piece, Atom Smasher's left arm. Mattel's BAFs tend to look pretty good, and this one carries that on, with a bulging musculature with little veins showing, gentle shading on the skin, and a big heavy-looking iron bracelet around the wrist. I'm caught between the two versions of Barda (which would be an enviable place to be if I wasn't just being metaphorical) - Mattel's choice to tone down the bright, flat colours of the original art makes for a more pleasing overall look, but you just can't ignore the dominating presence of DC Direct Barda's giant physique; if you wanted to put DCUC Barda next to her husband, you'd completely miss out on the size disparity between them. 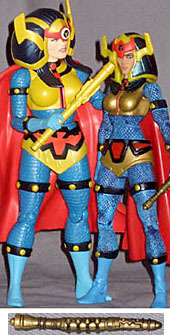 I think, in the end, I have to confess that size does matter - Mattel may have produced quite a good "Barda," but you just can't overlook the lack of "Big."